It's said that in Avalon, everyone lives in a castle and has a chest full of gold. Click here to play! It's a heaven on Earth. Unfortunately, explorers have always marked Avalon as being just over the horizon, where the monsters lie and death awaits every explorer. You, brave knight, have been charged by your Queen to search for Avalon. You will be amply rewarded if you can find it, and then return home with a map to this promised land. While the rewards of Avalon are great indeed, only a knight with a pure heart like yourself could resist the temptation to stay in Avalon and forget the arduous journey home. The Queen has judged you well, has she not? You could resist the temptation to stay in Avalon and leave the rest of us forever? You won't just retire there and think about how everyone back home is a chump will you? You're sure? Okay, well, we have plenty of supplies and equipment to help you on your quest, and we'll be sure to hold you a grand funeral in case... You know... Something happens. In the part of the map that says 'Here be dragons' and with the skull and crossbones drawn all over. If you can get beyond that nasty part, then silver chalices, golden crowns and many fine jewels await you in Avalon, we think! Please, hurry to the glorious mountaintops of Avalon and bring back a massive chest of gold and gems! The Lady of the Lake symbol is the scatter symbol, giving 12 free spins when three or more appear. 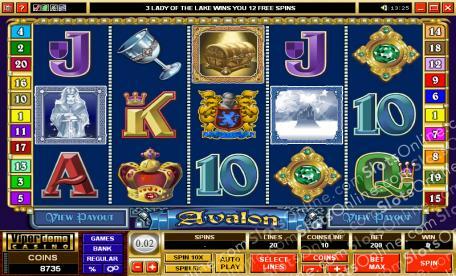 During free spins, Chest symbols also act as substitutes, in addition to the Avalon Castle symbol. Additionally, scatter symbols payout on the total bet. 2 symbols pay 2 times the bet, 3 symbols pay 4 times the bet, 4 symbols pay 20 times the bet, and 5 symbols pay 200 times the bet. The Avalon Castle symbol can substitute for any symbol other than the scatter symbol. There is a gamble bonus game, in which players may gamble a win by playing a simple game of chance. In the game, players must either guess whether a card will be red or black, or guess the suit for even bigger winnings. If guessed incorrectly, the win is lost.